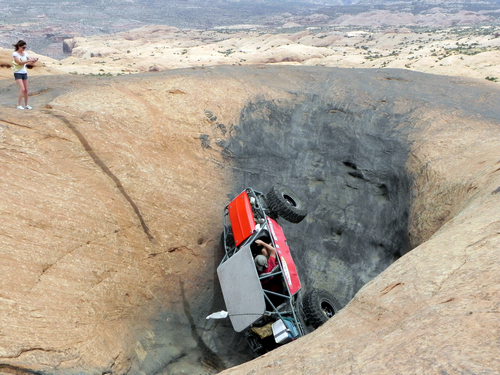 This premier slickrock trail lies northeast of Moab between Sand Flats Road and the river. The trail is clearly visible on the sandy parts of the route, but there are long stretches of slickrock where the 4WD trail has been marked (a yellow paint design that resembles a flame). 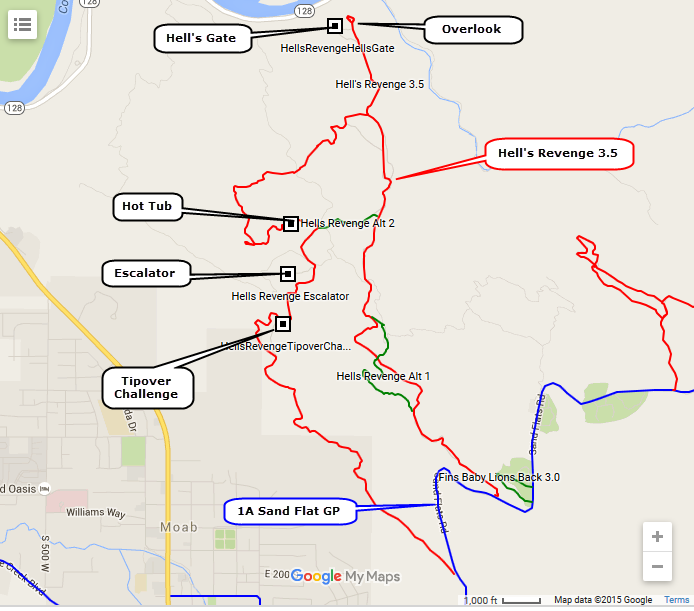 The most difficult obstacles are well out of the stock-vehicle class, and are not included in this version of the trail. There still are steep climbs and descents and some edges that are not for the faint of heart. 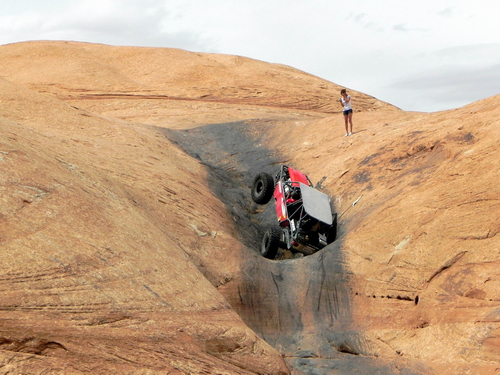 The scenery and many of the thrills of driving long stretches of slickrock remain, but the emphasis is on making the trail accessible to stock vehicles and drivers not anxious to break their equipment. 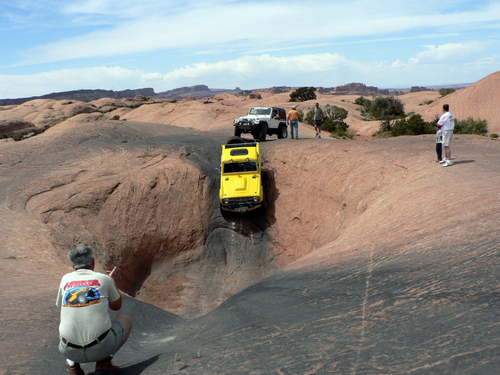 The major slickrock area includes steep climbs, sharp turns, and a hair-raising descent along a steep ridge with little room for error left or right. There are obstacles called the "Hot Tubs". 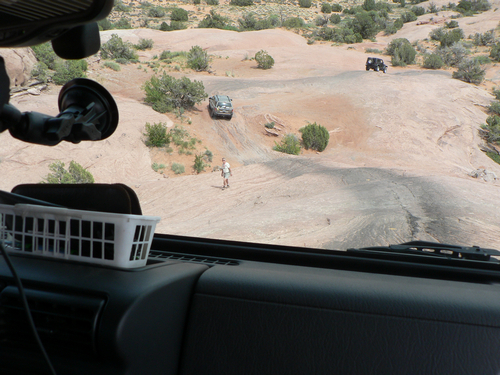 One is easily done by Jeeps, while the other (Devil's Hot Tub) is really a buggy hole. I believe Jeeps can do it with the help of a strap. 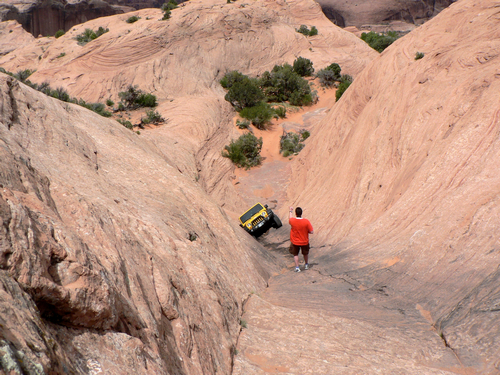 These obstacles can be done by well equipped Jeeps with experienced drivers, but are not included in this track.